All our trees are carefully selected for color and shape. The result is trees that are greener and fresher, and you have happy customers returning next year. All our trees have been carefully grown and selected. They are state inspected for shipment anywhere in the United States, except where local quarantines apply. 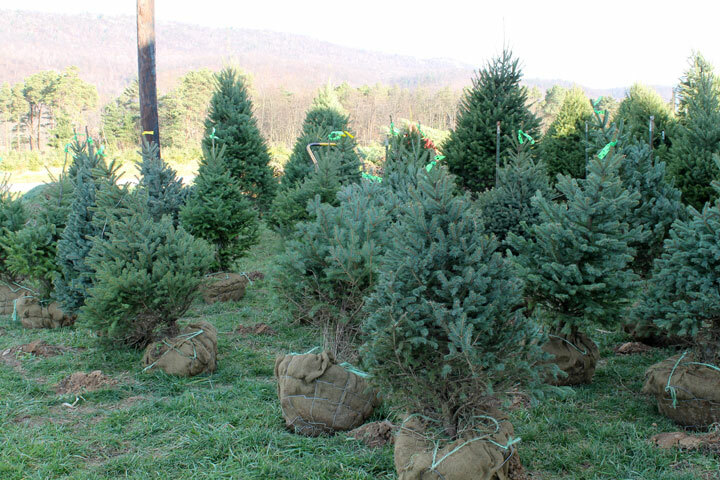 We invite you to come to the farm and inspect our trees before ordering. Please call ahead. Our Douglas fir are from Rocky Mountain seed sources and have been grown here on our farm in Central Pennsylvania to produce fine quality trees. To view or print a pdf of the lists, click here. We also have 3'-5' table trees available in all varieties for $9 to $15. Please call for availability and prices. Additional discounts may be available on large quantities. We require a 25% deposit with your order, the balance due by cash or certified check when your trees are picked up. If you prefer, we can arrange delivery with the balance due before trees are loaded. All prices are F.O.B our farm, at the Huntingdon/Blair County line on U.S. Route 22. Our lush Deluxe Mixed wreaths contain three or more of our various fresh greens that are grown here on the farm. 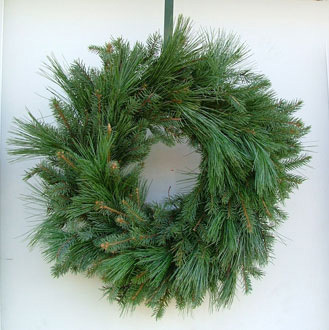 Wreaths may contain: Fraser Fir, Southwestern White Pine, Scotch Pine, Arbor Vitae, Spruce, Douglas Fir, and Concolor Fir. *Hemlock is good for outdoor use only. Grave blankets and pillows continue to contain a variety of different greens materials. White Pine Roping is available, but must be ordered early. On large orders of decorated wreaths or swags, bows will come boxed and ready to attach. Payments must be made in cash or by certified check. All prices F.O.B. our farm, one half mile east of the Huntingdon/Blair County line on U.S. Route 22. For delivery add 20%. If actual cost is higher, you will be billed for the higher cost. For split shipments, add $25 for each extra shipment. All products are made from greens freshly cut from the farm . A deposit of 25% is due with your order with the balance due on delivery or pickup. Ordering early is critical for wreath orders so we can have rings on hand. Please give us your wreath estimates as soon as possible.